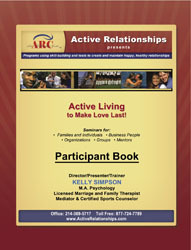 Active Living teaches the importance of intentional behaviors to keep relationships strong. It includes topics that increase the potential of building traditions to act on every day. This curriculum helps participants discover how to make the most of morning, rejoining and daily and weekly “little ” things that create strong lasting connections.